The noted jazz journalist Scott Yanow has reviewed Steve's In The Driver's Seat. Read the review here. 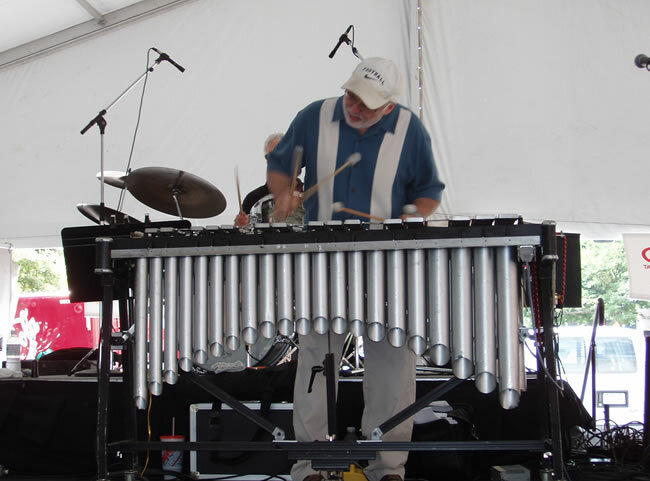 Steve is one of the many renowned artists on stage for this year's Omaha Riverfront Jazz and Blues Festival. See a screencap of the Saturday July 10th lineup. You may also see a screencap of an advertisement for the festival. Steve's performance at Jazz on the Green, Southwest Florida's Premier Jazz Event, on October 26-28th 2007 was very well received. For your examination, some images of the event, including a ID badge, two pages from the official 2007 Concert Program, and a newspaper clipping. 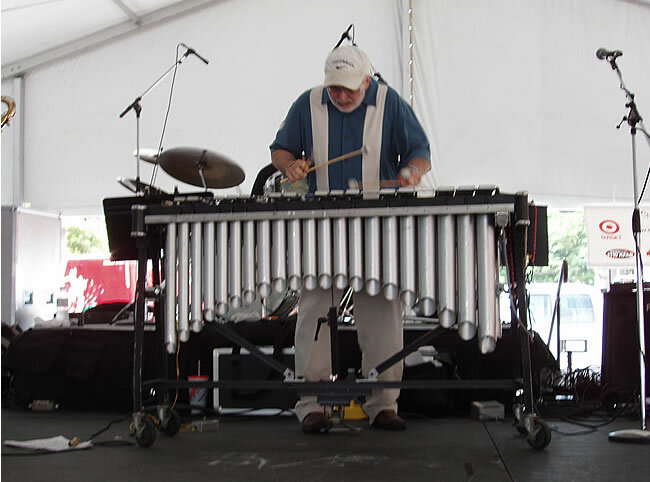 Here are three photos of Steve taken at the 2006 Omaha Riverfront Jazz and Blues Festival. Photo credit: Herb Thompson. See Photo #1. See Photo #2. See Photo #3. 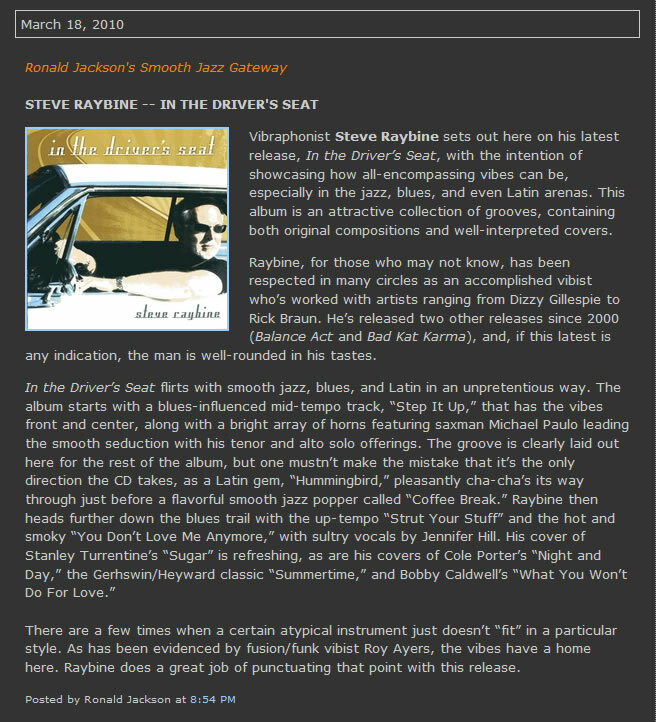 "In the Driver's Seat is a gigantic step forward for Steve Raybine within the Smooth Jazz genre. The CD is masterfully done. The production, the rhythmic drive and the musicianship is all top level and takes Raybine to a much higher level as a performer, composer and producer. The CD features some killer tracks with brilliant horn sections, exciting rhythmic grooves and great melodic hooks. We really like this record." Steve is a Musser Vibes Artist. This link will take you to his Musser page. From the archives.."Vintage Vibes"...an article about Steve. Steve was the subject of an article just published in The Reader which you may read here. Steve was interviewed by two radio stations in 2006 as his record Bad Kat Karma gained nationwide airplay. The interviews are available here for download as Mp3s. Enjoy. Download a screenshot of Steve's interview set list on KIOS-FM/Omaha's Last Call. 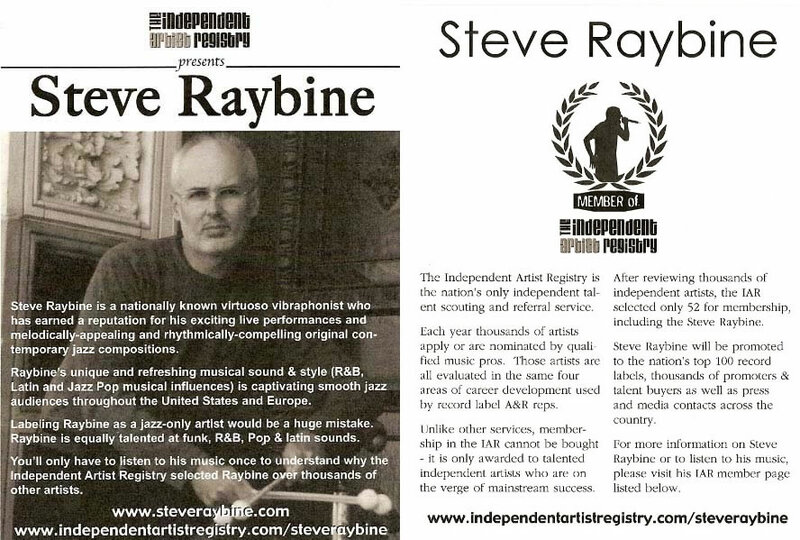 Steve Raybine was selected in 2006 to be in the Independent Artist Registry, which is a prestigious acknowledgment. Interestingly, thousands of bands and performers applied from all over the Midwest U.S., but only 44 were chosen and Steve was one of them. From the I.A.R. Website:The Independent Artist Registry is a talent scouting service for over 100 of the nation's top record labels. Its goal is to find and promote the US's top independent artists to a quarter million music industry professionals, including A&R reps. The I.A.R. evaluates artists in four categories and only selects the best artists for induction into the Registry. Read the Independent Artist Registry's press materials for Steve. 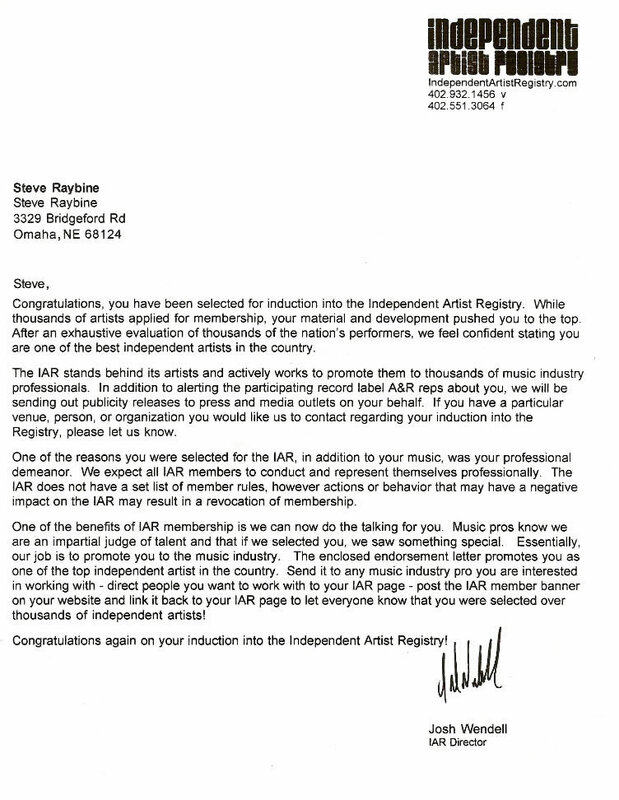 Read the Independent Artist Registry's press card for Steve. See a complete screenshot of Steve's webpage at the Independent Artist Registry website. 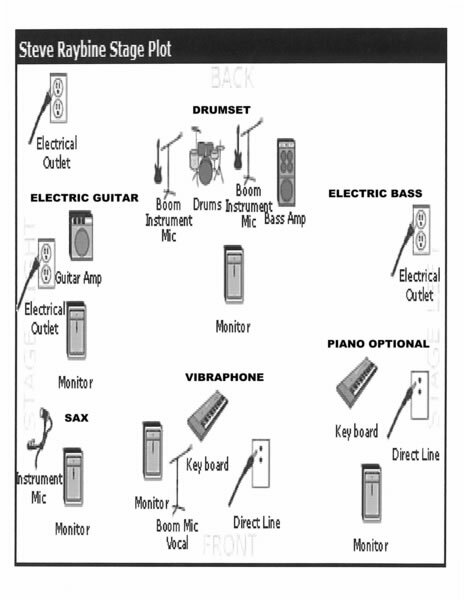 The Independent Artist Registry is affiliated with the Music Phone Book, which is a national publication. Steve's recording, Bad Kat Karma, received a very favorable response from jazz fans, the press, and radio stations worldwide. "I've LOVED Bad Kat Karma since the first listen. Hot, fresh & unique. It's time for vibes!" 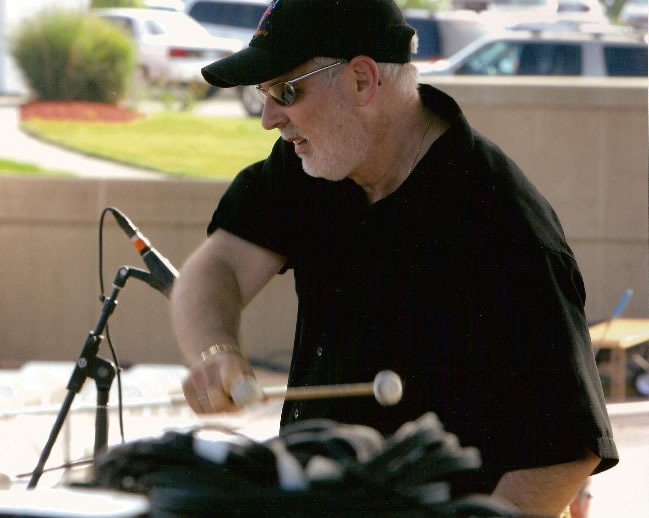 "Steve Raybine is known as 'Master of the Mallets.' BKK has a nice groove with intoxicating, hypnotic and catching melodies." "I added "Bad Kat Karma to our Up & Coming rotation today. Very COOL music!" "Thank you for sending Steve Raybine's cd, Bad Kat Karma. I am enjoying it. It is perfect for our format." Steve Raybine is truly a gifted composer and dynamic live performer. Bad Kat Karma is currently our favorite CD! A really remarkable, beautiful remake of George Benson's classic "Breezin'" ... listen to the "Master of the Mallets" at his best! Raybine has released the title track, "Bad Kat Karma," a funky R&B cut with a drivin' rhythm section and a great vibe and sax melody. Raybine's second single to be released will be "Breckenridge Blue," a gorgeous ballad laced with vibes and sax, capturing the mountainous beauty of Breckenridge, Colorado. "When we refer to Steve Raybine as an accomplished musician, it's an understatement. 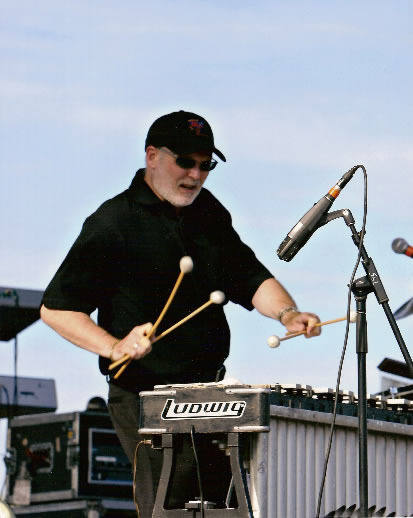 Steve is not only a virtuoso vibraphonist, percussionist, and composer/arranger, he is also an instructor and clinician.... BAD KAT KARMA is the 2nd solo release for this talented recording artist. This new collection of mostly original Smooth Jazz adeptly incorporates urban funk, R&B, pop and Latin influences. Steve's infectious melodies are sure to get you groovin'.... BAD KAT KARMA includes a fun, laid back version of the George Benson smash, "Breezin" featuring former Auracle band mate, Rick Braun on keyboards and programming as well as acclaimed flutist Steve Kujala. Braun also appears on the beautiful ballad, "Indigo Night," playing his instrument of choice: the trumpet. Saxman, Nelson Rangell appears on the exhilarating tune, "Bop City." Download a smoothjazz.com screenshot featuring Bad Kat Karma. Download a review of Bad Kat Karma. 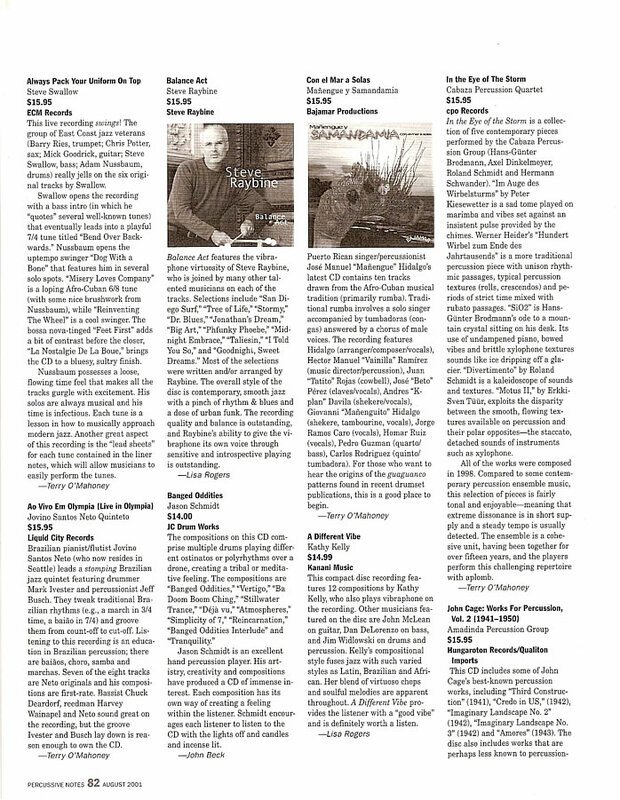 Download a review(translated) of Bad Kat Karma in Keys and Chords Magazine. Download an extensive review of Bad Kat Karma. Download a review of Bad Kat Karma from Smooth Jazz News. 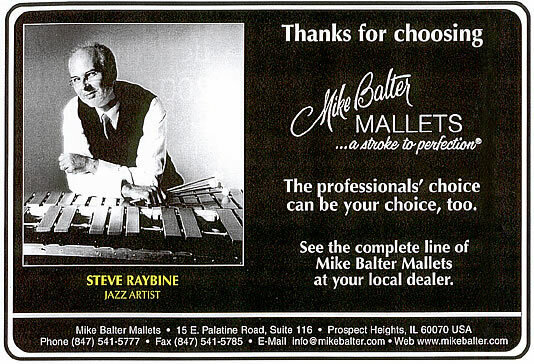 Download Steve's Mike Balter Mallets advertisement. 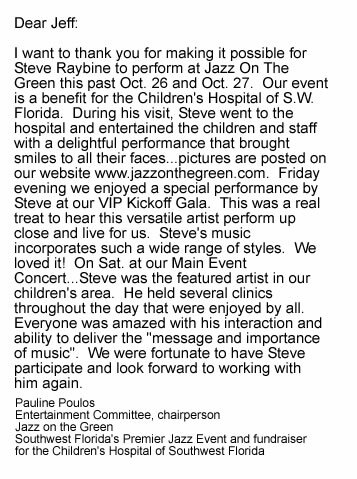 Read a brief testimonial about Steve's performances and clinics at Jazz on the Green in Florida in 2007. 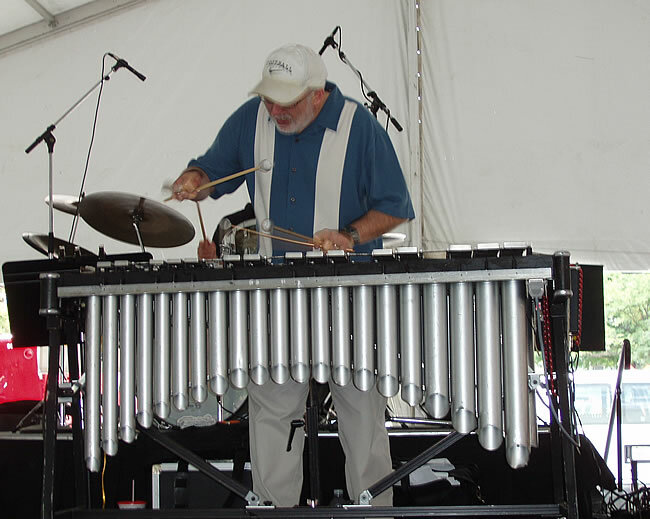 See an article about the 2006 Omaha Riverfront Jazz and Blues Festival featuring Steve. 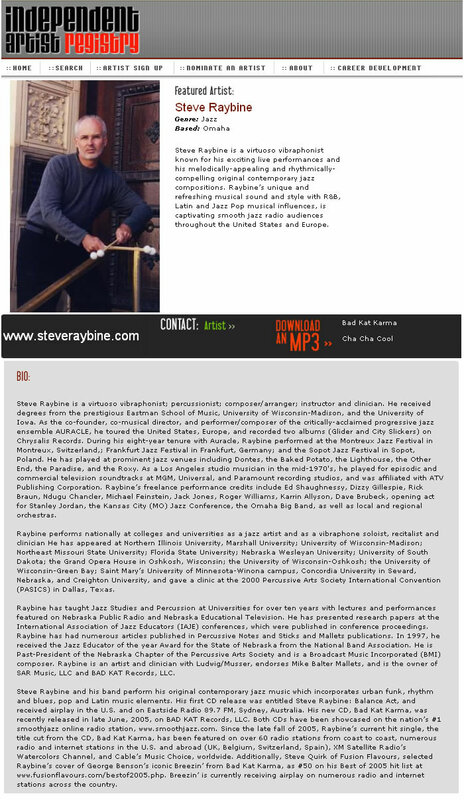 Download a screen shot from the Breckenridge Jazz Festival website-2006's program featured Steve! 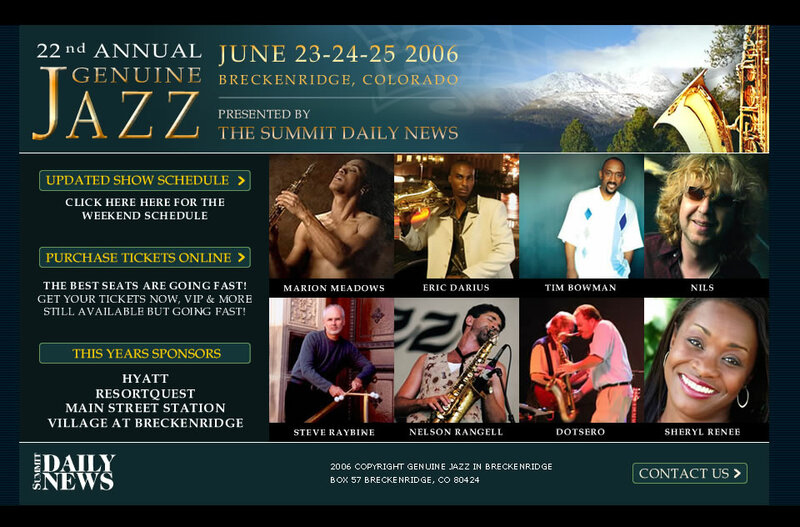 Download an article about the Breckenridge Jazz Festival that Steve performed at in 2003. 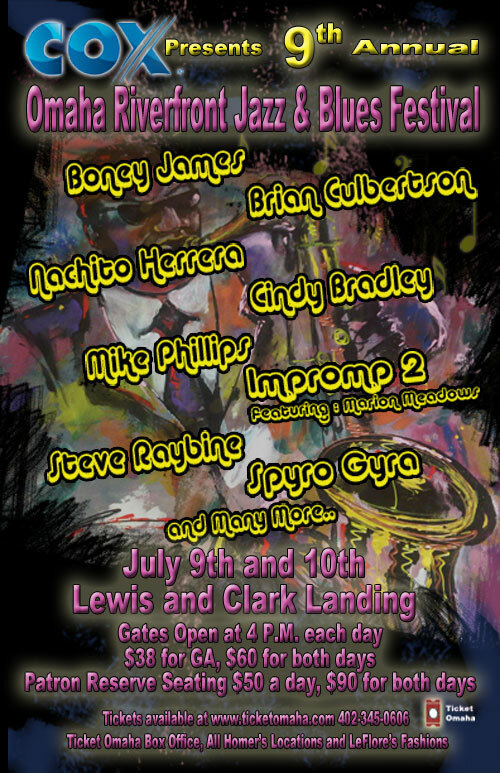 Download a poster of the Breckenridge Jazz Festival that Steve performed at in 2003. 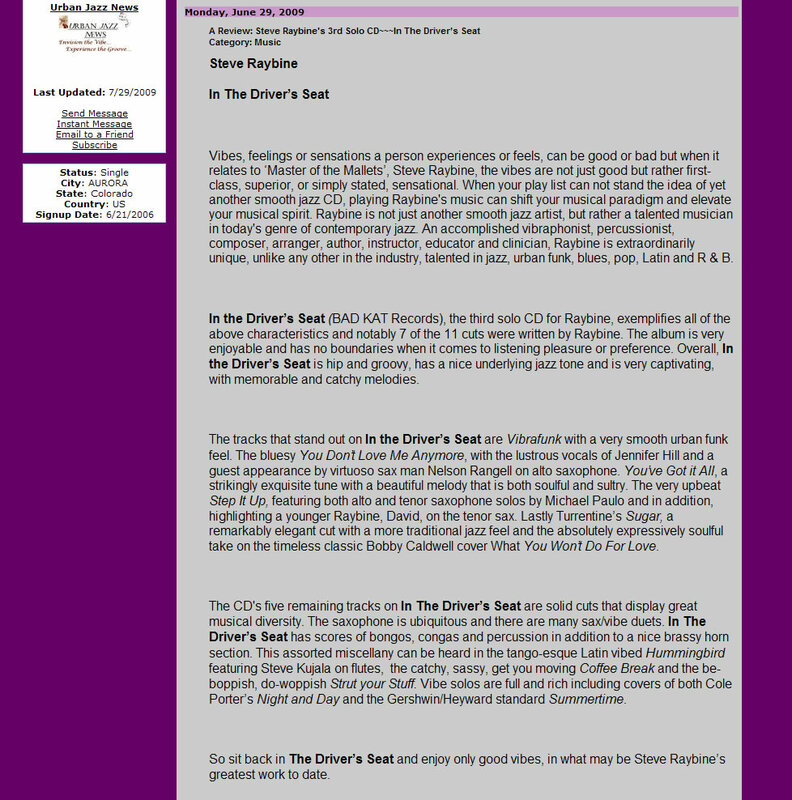 See a screenshot of Jazzlynx Cafe Jazz Radio Canada where Steve's record was featured. Download clippings of Steve's appearance with guitar legend Stanley Jordan. Download a Montreux Jazz Festival article about Auracle. Download a review of Balance Act. 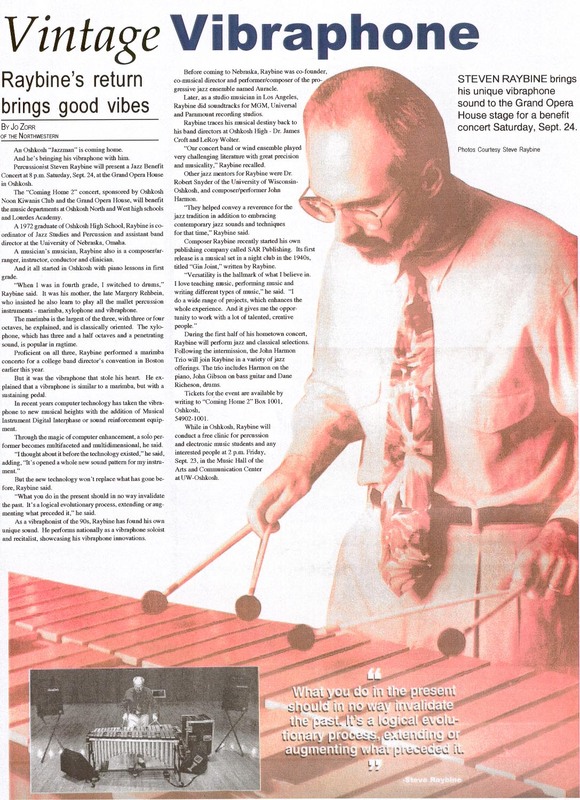 Read a review of Balance Act from the August 2001 edition of Percussion Notes. See an article on Steve from an internet radio station from Poland. See a December 2006 chart listing with Steve from The Source-DJ Music Supply. 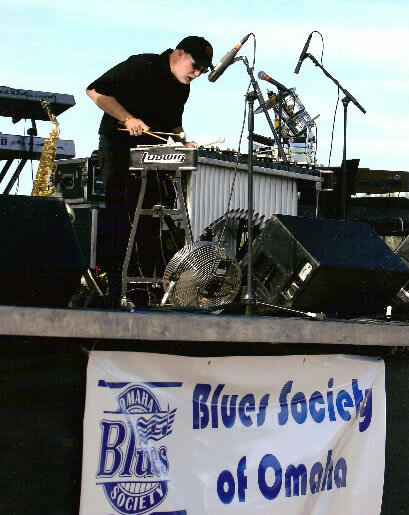 Download a composite screenshot of Omaha Riverfront Jazz and Blues Festival website pages featuring Steve. Take a look at 4 photos of Steve taken at the 2007 Omaha Summer Arts Festival. 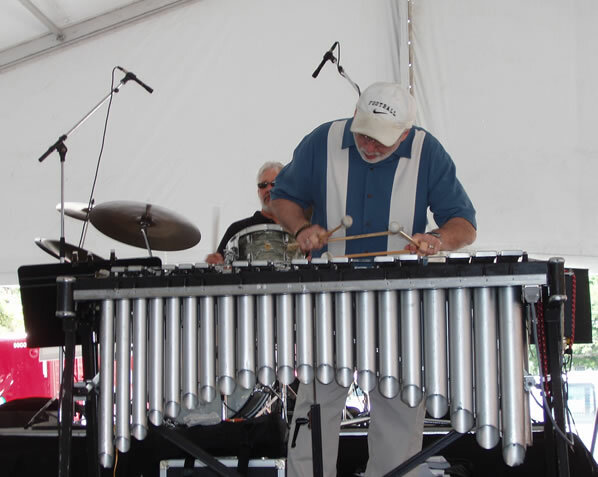 Steve was the featured performer with the Omaha Musicians Association Jazz All-Stars who opened the festival. Photo credit: Chris Cooke. See Photo #1. See Photo #2. See Photo #3. See Photo #4.